Summer just got a little more awesome, at least at Epcot. Guardians of the Galaxy -Awesome Mix Live! is returning for a second year this summer. According to the Orlando Sentinel, the show will start an encore performance at Epcot’s America Gardens Theatre on June 14 and will run through August 18. The show stars Star-Lord and Gamora and features some fun, or should I say awesome, music that gets everyone moving in their seats. I saw this show last year and I would definitely go to see it again. The whole show from the music to the acting was very entertaining and enjoyable. I liked the music they chose for the show, but I’m not sure if they are planning to use that same songs this time around. 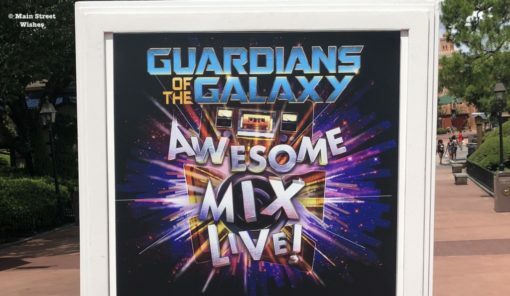 If you plan to go to the show this year I suggest not only watching the singers but to keep an eye on Star-Lord and Gamora while the songs are playing. There were often fun interactions happening in the background. For instance, during one song Star-Lord broke out the cowbell and was proudly playing it with a huge smile on his face. He walked over to Gamora and enthusiastically played the cowbell in front of her while giving her a big smile and without missing a beat she knocked it right out of his hand. So if you’re in Epcot this summer I recommend checking out this show. It’s a fun experience to add to your day! As more details are released we will update.